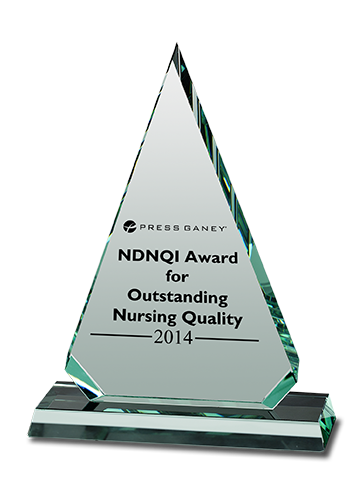 November 24, 2014 (Englewood, CO) – Craig Hospital is proud to announce it has been named a winner of the 2014 NDNQI Award for Outstanding Nursing Quality by Press Ganey Associates, Inc. The award recognizes the top-performing rehabilitation hospital that has achieved excellence in overall performance in nursing quality indicators. This is the fourth time in five years Craig Hospital has received this recognition. The NDNQI Award for Outstanding Nursing Quality honors hospitals that have made impressive and measurable improvements in nursing performance and patient outcomes. The award is given annually to the top performing facility in each of seven categories: academic medical center, teaching hospital, community hospital, pediatric hospital, rehabilitation hospital, psychiatric hospital and international. Press Ganey is the nation’s leading health care performance improvement company and partners with more than 11,000 health care facilities, including more than half of all U.S. hospitals, to reduce suffering and improve the patient experience. Compared to other rehabilitation hospitals and hospitals with the Magnet designation, Craig Hospital performs consistently higher than the national average. The quality nursing indicators used in the determination of the NDNQI award include: falls, hospital acquired pressure ulcers and infection rates, which are consistently low at Craig Hospital. Craig Hospital ranks high in RN satisfaction. RN satisfaction scores are compared in categories including RN-physician relationships, staffing and resource adequacy, nurse manager performance, foundations for quality of care, and participation in hospital affairs.